So far in this series on alkenes, we’ve gone through two families of mechanism pathways. In the carbocation pathway, we saw reactions that proceed with “Markovnikov” regioselectivity, a mixture of “syn” and “anti” stereochemistry, and can be accompanied by rearrangements. In the 3 membered ring pathway, the regiochemistry is also “Markovnikov”, the stereochemistry is trans (anti), and the reaction proceeds through a 3 membered ring intermediate. We’ve met at least a dozen different alkene reactions that can fit into these families so far. But then along comes a reaction that doesn’t fit. In the mid 1950’s, H.C. Brown and B. Subba Rao were investigating the use of boron hydrides as reducing agents. When performing the reduction of an unsaturated ester (ethyl oleate) with NaBH4 and catalytic AlCl3 , Subba Rao observed that an excess number of mole equivalents of boron hydride were consumed: 2.37 ( vs. 2.00 for the reaction of saturated ethyl stearate) . Upon further investigation it was found that B-H was in fact adding to the alkene, in a reaction that subsequently became known as “hydroboration”. Note that the hydrogen is adding to the more substituted end of the carbon (“anti-Markovnikov”) and the stereochemistry is syn. This doesn’t fit with any of the patterns we’ve seen before! That means it’s likely going through a different mechanism! Furthermore, trapping by solvent is not observed (actually protic solvents are generally a bad idea for hydroboration, as they lead to formation of hydrogen gas and destruction of borane itself). Interestingly if we add an excess of alkene, we can observe multiple hydroborations. If presented with sufficient alkene, for example, BH3 can perform three additions to alkenes. Finally, it is of interest that organoborane compounds are not particularly stable under atmospheric conditions (they tend to react with oxygen, burning with a beautiful green flame). However, they can be easily converted to alcohols, which are extremely valuable compounds. The transformation of organoboranes to alcohols can be performed by treating them with basic hydrogen peroxide. This process is called “hydroboration-oxidation”. Note how the stereochemistry of the C-B bond is preserved in the C-O bond. How might we explain all these observations? Chew on them for a bit and we’ll go through a proposed mechanism next time. I received the Assoc. Sci. degree from Wright Junior College (Chicago) in 1935 and the B.S. degree from the University of Chicago in 1936. Why did I decide to undertake my doctorate research in the exotic field of boron hydrides? As it happened, my girl friend, Sarah Baylen, soon to become my wife, presented me with a graduation gift, Alfred Stock’s book, The Hydrides of Boron and Silicon. I read this book and became interested in the subject. How did it happen that she selected this particular book? This was the time of the Depression. none of us had much money. It appears that she selected as her gift the most economical chemistry book ($2.06) available in the University of Chicago bookstore. Such are the developments that can shape a career! ** Another neat feature of this reaction, not treated in detail here, is that hydroboration is reversible; heating of the organoborane can result in reversion to borane and alkene, and subsequent hydroboration. In such a way can organoborane compounds isomerize, provided there is a sufficient driving force. – “hydrogen is adding to the less substituted end of the carbon (“anti-Markovnikov”)” – shouldn’t that be “more substituted”? – figure 1: “H and B add to opposite faces of alkene” – shouldn’t it be “the same face”, since the stereochemistry is syn? Thank you, as always. Taken awhile to fix this but finally fixed. What do you do when you have the hydroboration of an alkene with multiple double bonds? The more electron rich double bond would react preferentially, although I would imagine in a mixture, and if diborane were in excess, it would hydroborate every double bond. This is for carbon-carbon double bonds. 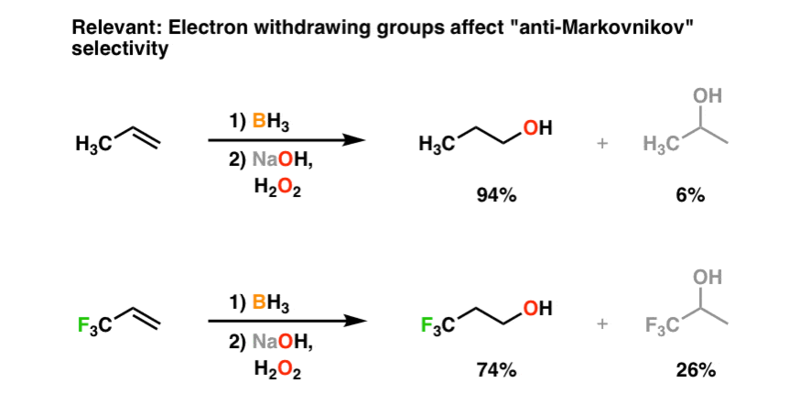 Heterogeneous double bonds may not react with BH3 if they are electron deficient, at least not without a catalyst (for example a nitro group) or in general react very slowly (like an acid chloride). This is because BH3 is an “electrophilic” reducing agent. With only three valence electrons, it’s both planar and its octet is not full. An unfilled octet means it has an open orbital for electrons to come in, and being planar makes it easy for such electrons to approach. This is why it adds to alkenes: the pi bond in a double bond has two accessible electrons to fill the empty BH3 orbital. An electron deficient moiety will not have electrons easily available to give to BH3, so BH3 adds slowly or requires a catalyst. Contrast this with NaBH4, which is a “nucleophilic” reducing agent. The boron’s octet is full; there’s no empty orbital to fill by attack from external electrons. However, here the B-H bond is polarized with electrons toward hydrogen, allowing hydrogen to add as a nucleophlic hydride, instead of boron as in the electrophilic case. It’s not a strong reducing agent and won’t reduce many types of double bonds, but with the right alkali metal (Na < Li < Mg < Al), the reducing power of the nucleophilic hydride increases. So-called borohydrides can selectively reduce double bonds based on its reducing power. That selectivity is very useful when you want to target a specific double bond without affecting another double bond in the same molecule.